Spokane County’s hearing examiner will soon decide the fate of a developer’s proposal to build multiple duplexes and town houses on the former site of Bergman’s Christmas Tree Farm. The proposal – filed in Spokane County last year by engineering firm Whipple Consulting Engineers on behalf of developer Dennis Crapo – calls for more than 75 single family homes, town houses and duplexes on more than nine acres near East 28th Avenue and South Adams Road. The project drew opposition from many residents as well as the Bergman family, who told The Spokesman-Review last year they were misled and regret selling the land to Crapo. Residents are frustrated about the development because it could reduce property valuesand increase traffic. Also, the project’s density doesn’t fit in with the rural character of the neighborhood. The tree farm site, zoned low-density residential, allows for a maximum of six homes per acre, according to Spokane County zoning regulations. However, Crapo is proposing a planned unit development that allows for bonus density of 10 units per acre if he includes a mix of housing types, sidewalk improvements, open space, trails and a community park. “This PUD will provide families three housing options to fit their budget – single family town houses and duplexes. Ease of access to bus lines and business areas north of Adams will allow families multimodal transportation to fit all incomes,” said Whipple in a letter to hearing examiner, Brian McGinn, who is ruling on the case. Spokane County’s hearing examiner, David Hubert, had to recuse himself from the case, citing a conflict of interest. Resident James Hollingsworth said at a Jan. 16 hearing that he’s lived in the neighborhood for 33 years, and most development has been single family homes, which is suitable for the area. Hollingsworth said he’s not opposed to development, but is concerned about the project’s high density and that it’s multifamily units disguised as single family homes. It’s indicated in Whipple’s letter to the hearing examiner the proposed town houses and duplexes will be rental units. Hollingsworth said the neighborhood has conducted several public meetings that weren’t attended by Crapo. 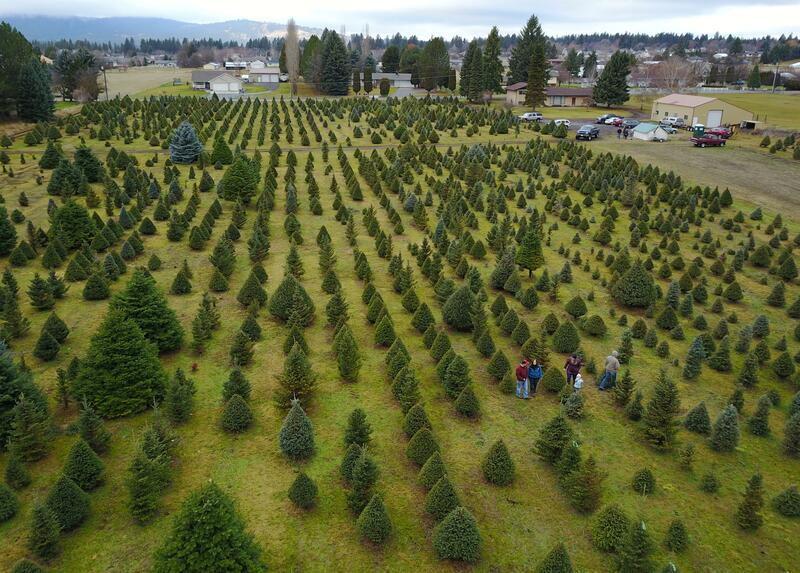 Bergman’s Christmas Tree Farm was a staple in Spokane Valley for many years. It was established by Don and Nelda Bergman, who purchased the 30-acre vegetable farm in 1969. A decade later, the family planted tree saplings on 20 acres of the land and converted it into a tree farm, which gained popularity with residents during the holiday season by the mid-1980s. In 2016, when Bergman died from cancer, his five children were faced with the difficult decision to close the tree farm and sell the land. The five Bergman siblings sold the land to Crapo for $915,000 in 2017, according to records from the Spokane County assessor’s office. Dede Bergman told The Spokesman-Review last April that the family took “a lot of heat for selling the property,” but they thought any future development would be low density because the county told them that zoning couldn’t be changed. She also added that Crapo failed to mention any future development would be high density. Tammy Jones, principal planner for Spokane County, said the project density is “considerably higher than anything that exists in that area,” but requests for bonus density in a PUD is subject to approval by the hearing examiner. Several more residents testified at the hearing, with most requesting Crapo extend a walking path or sidewalk to 32nd Avenue and Adams Road and add a fence along the north side of the development to reduce noise. Cheryl Schwahn, a resident of the neighborhood for more than 30 years, said the general consensus among residents is to deny the bonus density request. Crapo’s attorney, Taudd Hume of Parsons, Burnett, Bjordahl, Hume, testified that it’s unfair to characterize the area as low-density residential because it’s in the urban growth area and carries the potential to be zoned at a higher density. The Growth Management Act has a strong preference for a diversity of affordable housing types with a variety of densities, he said. “One of the things this particular housing project gives a nod to in the GMA is housing affordability and as we continue to struggle with our housing supply in this community, it’s projects like this that address and honor that obligation under the GMA,” he said. The hearing examiner will decide to either approve or deny the project with the next two weeks. Published: Feb. 7, 2019, 5 a.m.